While Easter isn’t really about bunnies or baskets — our families celebrate that He has Risen — we also enjoy sharing the fun, whimsical traditions with our loved ones. We couldn’t resist crocheting a Peep candy bunny to share with all of you. He (or she) can be any color you’d like — and remain calorie free! Bonus! 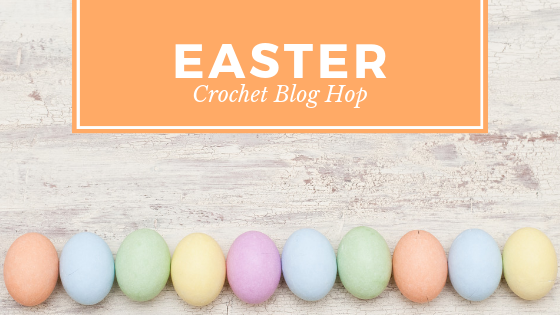 This year we’ve also partnered with some of our most favorite, talented Crochet Designers to bring you an Easter Blog Hop! Are you ready for some FREE Easter cuteness!? 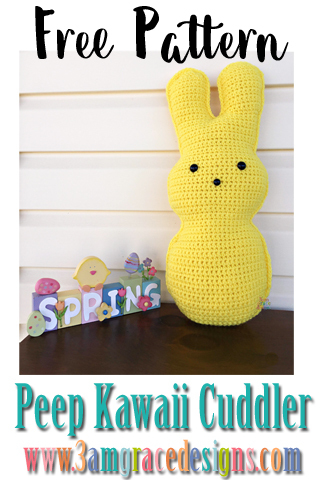 In addition to our Peep Kawaii Cuddler, be sure to check out these designers & free patterns. 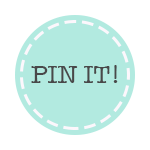 We will be updating the links as their patterns go live! Below you will find instructions to make your very own Peep! Enjoy! Have a blessed Easter with those you love! * Place safety eyes roughly between Rows 49-50, 8 stitches apart. * Place the safety nose between Rows 43-44 centered between eyes. * Align Peep halves so ends of rows match. With wrong sides facing each other, single crochet around both pieces to join together. Stuff with Poly-Fil prior to completing stitching. Make sure you work in a counter-clockwise direction so your stitches face forward. 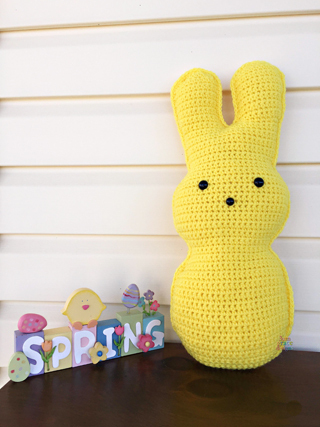 Our yellow Easter Peep Kawaii Cuddler pictured was made with 5.5mm hook and is 19″ tall. Our purple Easter Peep Kawaii Cuddler pictured was made with 5 mm hook and is 18″ tall. Your hook size, yarn choice, and crochet tension will affect your individual result. All photos and text are copyright © 2019 – 3amgracedesigns. All rights reserved. Please do not sell or distribute this pattern in part or in whole. You are welcome to sell finished items you make from this pattern. A credit to “3amgracedesigns” as the designer is appreciated but not required. For more crochet inspiration, sign up to receive our Newsletter! Thank you! Do you have a pattern for a smaller version of the Easter Peep Kawaii Cuddler? Hi Cindy! I do not – however, you can use a smaller hook and that will bring down the size some. I used a G, for me it came out 12”, made an 18” also, so cute. Taking pix on Saturday, I will share! Hi Karen! I don’t have the exact yardage but I know it didn’t take more than one skein per Peep when I was using an H Hook. Can’t wait to see yours! This is so adorable I’d love to make a big squishy one with bernet blanket yarn with a N hook do you think this is possible to do following your pattern? Hello do u have a video of this or parts of a video. I’m stuck on the ears? We do not have a video of this pattern. 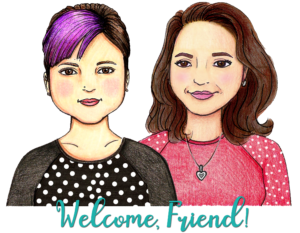 You are welcome to email me at [email protected] or post in our Facebook group and we’ll gladly help you! When it says Inc…. I’m guessing you mean 2sc in one stitch. Is that correct…. I’m making a peep n row 2 just doesn’t look right for some reason. Am I doing it right please? Yes, Inc means two single crochets in the same stitch. For Row 2, you will single crochet in the first stitch, two single crochets in the next stitch, one single crochet in the next seven stitches, two single crochets in the next stitch, and one single crochet in the last stitch. So I’m doing this with the Bernat Blanket yarn and a 5.5 mm hook. One skein per panel and it’s taller than my 4 year old!!! She’s just about 3.5 ft tall. I can’t stop laughing as this is going to be a birthday gift for a one year old. She can grow into it lol. Thank you for the pattern. It has worked up beautifully. That sounds amazing Chrissy! Can’t wait to see it! Hi are we able to sell these (with pattern credit to you guys) I love all your guys patterns! I am new to crocheting and awful at reading patterns but I want to make this. Working on the Fornite cal now, loving it by the way!! In this peep bunny what are the numbers at the end of the row in parentheses? Sorry for such a dumb question. Never a dumb question. Those are the stitch counts for the row. If the number in parenthesis is 12, you should have 12 stitches in your row when it’s complete. Row 64 After the decrease shouldn’t that then be the next row? Or are you saying.. continue on that same row till end?? You are going to build both a left ear and a right ear with Row 64. I made 4 of these with the new Bernat Velvet. They are so soft & cuddly! I was able to get 2 peeps from 1 skein. Thank you!! Oh I bet! That yarn is so soft and squishy!